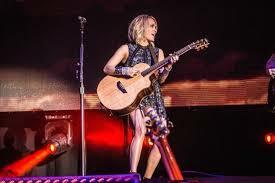 On Saturday September 10, Carrie Underwood brought her Storyteller Tour to the SAP Center in San Jose. We made the decision to go the day before. At the end of the concert, my wife and I both agreed that Carrie Underwood is one heck of a singer and one heck of a superstar. It.” “Good Girl” then her latest hit “Church Bells.” I was really impressed how she can belt each song out for nearly two hours. She left the stage four times during the concert, to entertain us with a new outfit. Whether it was a pants suit, short dress or long stress, she was always elegant and very grateful to her audience. Underwood was always in tune with her audience. She covered the stage from one end to the other all night - making sure she posed for photos as she made her rounds on stage, always giving a friendly wave. The mix of her songs was perfect … several upbeat tunes followed by a couple of slow hits, really a good blend. She always had the crowd’s attention. Carrie also doesn’t mind giving up the spotlight. During a few of her hit songs, she let the audience take the lead singing. During her performance of “Jesus, Take the Wheel” and “Before He Cheats” the audience was happy to step in a take the lead. During “Choctaw County Affair” Underwood showed off her musical talent performing harmonica. During this song there were videos of her husband Mike Fisher and her baby son Isaiah on the big screen. During her performance of “Mountain Music” Underwood started out then brought out her opening acts … Easton Corbin and The Swon Brothers to join her. Cowboy Casanova – she sang this sitting on top of a large Jukebox! It hard to believe it’s been 11 years since she competed on “American Idol.” She is a gifted singer and has proven herself to be a top notch entertainer. The Storyteller Tour continues through December 17, finishing in Brisbane Australia. I admit, I never saw Carrie Underwood perform during her appearance on American Idol … but I’m sure glad we got to see her on her recent tour in San Jose.